The holotype is thought to be deposited in the Museum of Natural History, Nice, France, but its existence is uncertain. Grimalditeuthis bonplandi is very gelatinous and contains vesiculate tissue in the head, arms and mantle. 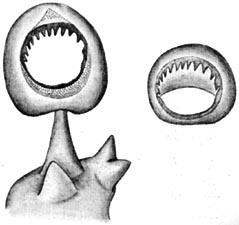 It is generally Chiroteuthis-like in appearance (long neck, body and fin shape) but is distinguished by subequal arms and fusion of each funnel-mantle locking apparatus. Only scattered chromatophores are present, and the eyes are small. This species is infrequently captured but seems to have a world-wide distribution in tropical to temperate seas. with funnel fused to mantle at each funnel-mantle lock. without photophores except on arm tips in mature (?) females. Arms approximately subequal in length, gelatinous. Sucker base with three conical papillae (unique character). Figure. Oral view of large arm III sucker, stalk and base, with inner ring at right, G. bonplandi, 89 mm ML, female, off Southern California. Drawing from Young (1972). Figure. Tentacle-clubs of G. bomplandi. A - Aboral view. B - Oral view. a single intact tentacle was found on a specimen taken from the stomach of the fish Alepisaurus ferox (courtesy of Lourdes Burgess). The tentacle club lacked suckers and showed no indication that suckers or sucker stalks were ever present as the skin was intact. Drawings by A. D. Hart. Olfactory organ located lateral to base of funnel (i.e., immediately anterior to collar at posterior end of neck). Funnel fused to mantle at each funnel-mantle locking-apparatus (head not fused to mantle in nuchal region). Absent accept at the arm tips of mature (?) females (See "More details ..."). Tail retained in adults with two fin-like "floatation devices" (= secondary fins) arise from tail. The function of the suckerless club is unknown. 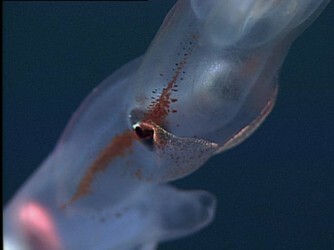 The extremely thin tentacle stalks (these fragile structures are almost always lost during capture by trawls) indicate that typical tentacle deployment would be difficult. The proximal fused trabeculae of the club can function as fins that can flap to extend the tentacle. This combined with wiggling of the muscular core of the club indicates that the club can swim itself into position, and once in position, wiggling of the club might attract potential prey for the squid (Hoving, et al., 2015). In contrast to extension of the tentacle, retraction can occur quickly as the squid swims towards the club. The MBARI video, seen here, shows evidence for this use of the clubs. Look at this one also. This species also has a very characteristic pattern of chromatophores on the head. A line of chromatophores passes across the ventral surface of the head between the anterior ends of eyes; another line runs along the neck from each olfactory papilla anteriorly to each eye, then anterior to each eye along the brachial pillar, terminating at the base of the arms. Figure. Insitu ventrolateral view of the head of G. bonplandi showing the characteristic chromatophore strip along the side of the head and a previously unrecognized iridescent patches on the ventral side of the head. Photograph © 2011 MBARI. Joubin (1898) described a second species, G. richardi based on the presence of photophores on the tips of the arms. Pfeffer (1912) synonomized the two and this was supported by Young (1972) and Nesis (1982). The doratopsis was first described by Chun (1910) as Doratopsis sagitta. A growth series of the paralarvae was described by Young (1991), and can be found below. The early doratopsis stage is similar to that of other species in the family. 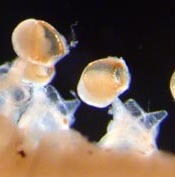 The older doratopsis shows many of the features of the subadult including the distinctive chromatophore pattern and the small eyes. Position of the olfactory papillae opposite the base of the funnel. Distinctive chromatophore pattern on the head (same as subadult pattern). Separation of optic lobes from brain. Anterior position of the superior buccal and brachial lobes. A long brachial pillar with a centrally located esophagus. Number of chromatophores on the funnel shoulders and the ventral head posterior to the eyes. Shape of the vesiculate area on the posterior end of the mantle (nearly flat anteriorly). 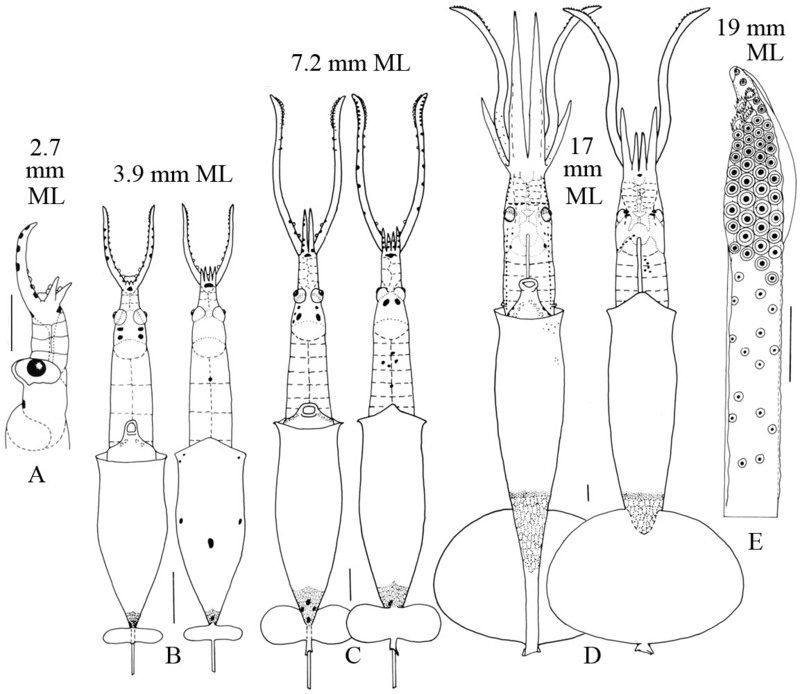 A small number of captures off Hawaii (Young 1978) included three small squid from the upper 350 m that probably had not descended from the shallow paralarval habitat and five squid from depths greater than 700 m.
Figure. Vertical distribution chart of G. bonplandi, Hawaiian waters. Captures were made with both open and opening/closing trawls. Bars - Fishing depth-range of opening/closing trawl. Circle - Modal fishing depth for either trawl. Blue color - Night captures. Yellow color - Day captures. Chart modified from Young (1978). The type locality is 29° N and 39° W in the North Atlantic. It is known from the tropical and subtropical North Atlantic and the tropical and temperate North Pacific (Nesis, 1982). Joubin, L. 1898. Observations sur divers Cephaloppodes. Quatrieme note: Grimalditeuthis Richardi Joubin 1898. Bulletin de la Societe Zoologique de France, 23: 101-113.
modified from Young, R. E. 1972. The systematics and areal distribution of pelagic cephalopods from the seas off Southern California. Smithson. Contr. Zool. 97:1-159. The photograph shows the delicate, translucent nature of the fin and its light pigmentation. 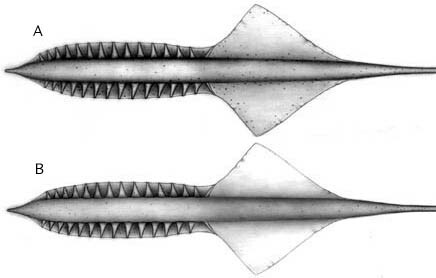 A human finger can be seen behind the fin. Page: Tree of Life Grimalditeuthis Joubin, 1898. Grimalditeuthis bonplandi (Verany, 1839). Authored by Richard E. Young and Clyde F. E. Roper. The TEXT of this page is licensed under the Creative Commons Attribution-NonCommercial License - Version 3.0. Note that images and other media featured on this page are each governed by their own license, and they may or may not be available for reuse. Click on an image or a media link to access the media data window, which provides the relevant licensing information. For the general terms and conditions of ToL material reuse and redistribution, please see the Tree of Life Copyright Policies.